Financial services enterprises must stay compliant with rules set forth by The USA Patriot Act. Here's how. across all their phone communications? you could listen to every minute of every call? In an ever-developing financial services world, compliance administrators are no longer solely responsible for conducting business in accordance with regulations set forth by consumer protection groups like the BCFP and FTC. They have also been placed on the frontlines of defense to uphold the The USA Patriot Act of 2001 - an Act passed by Congress as a response to the attacks on 9/11. With the responsibility of transferring trillions of dollars around the world each year, financial services companies have the obligation to ensure funds are deposited into the correct accounts, to the correct people and out of the hands of terrorists and imposters. These imposters aren't hacking into mainframes and stealing personal information with lines of computer code; they are picking up the phone and pretending to be someone they are not. Once they are successful in convincing the financial institution they are calling with their phony identity, these imposters have free rein to extract as much information as they want, and conduct business however they feel. To further protect against this type of fraud, the Patriot Act developed a provision in 2003 titled Customer Identification Program (CIP) which requires that before any financial related topics are discussed, the financial institution must confirm within reasonable doubt that fraud is not taking place. This means confirming a caller's full name, date of birth, social security number, mothers maiden name, account numbers, email address and so on during phone interactions. It’s a laborious but paramount process to carry out during a phone call — and even more so — to monitor for across hundreds of thousands of calls within an organization. PerformLine’s call center monitoring solution empowers enterprises with the ability to monitor their business's unique CIP requirements. By using software automation and a sophisticated rules engine that performs at scale, teams can confidently ensure compliance. The same logic that a human would use while listening to a call can be deployed within the PerformLine platform and applied to every minute of every call recorded in any organization’s call center. Results are ranked in severity of infraction and surfaced to compliance or QA teams for remediation. That means your team only listens to calls that matter most to them, and spends more time acting, remediating and training your organization rather than listening to calls. Get in touch with us for more information and a live demo on how PerformLine can automate your organization’s custom CIP compliance requirements today. Mike works closely with PerformLine's call center monitoring clients as a Business Intelligence Associate. In doing so, he helps clients uncover hidden information in their call centers and surface it with actionable reporting and analytics. In his free time, Mike can be found on one of his many bicycles or summiting a high altitude peak. 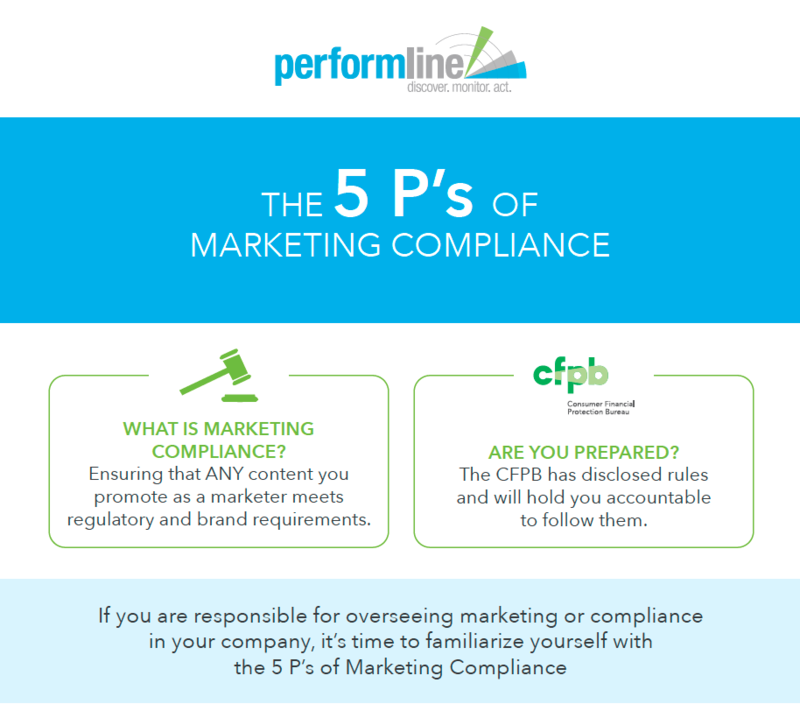 Download our 5 P's of Marketing Compliance.